Exciting updates are in store for the Cooperage complex at 55-59 Chicago Street. Vacant since 2001, the historic complex has unfortunately faced extensive structural damage too widespread for rehabilitation. Despite the history of the complex first built in the 1850s, the Preservation Board has approved demolition to multiple structures within the complex which will allow Ellicott Development the opportunity to create a new Cooperage, set to be an entertainment destination. The renovations and construction which will take place on Chicago Street will supplement the existing development the neighborhood has seen, including 301 Ohio Street. The construction and renovation will consist of 2 main structures, a three-story, 30,000sf new build and a two-story, 25,000sf mix of new build and renovation. 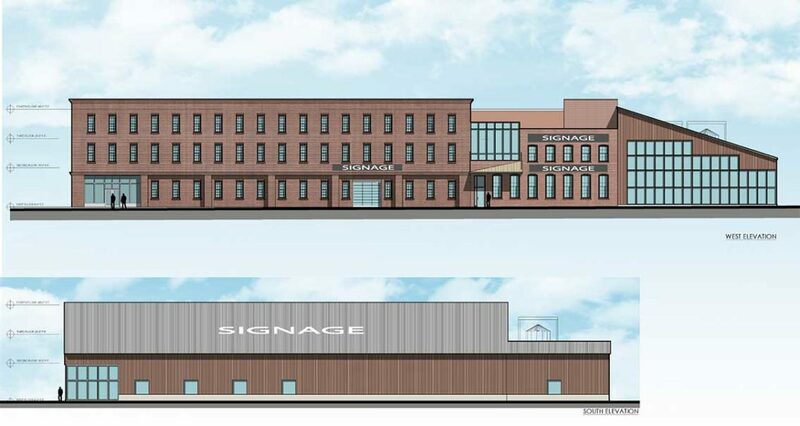 The 30,000sf new build will have a historic-style brick exterior, resembling the original Cooperage complex. Uses of this building will include a 5,000sf distillery, 2,000sf of available retail space, and six residential units on the second and third floors. The 25,000sf structure will consist of the gutting and renovation of the Pattern building, a 10,000sf addition built in 1913, for the restaurant and retail portion of a brewery, and the construction of a 15,000sf side addition to hold the manufacturing portion. A three-story, multi-use new build to the back of the complex will hold a gymnasium which will offer activities like rock climbing and zip lining. With a signed contract in place and the purchase deal soon to be closed, construction work could begin as early as mid-2018.